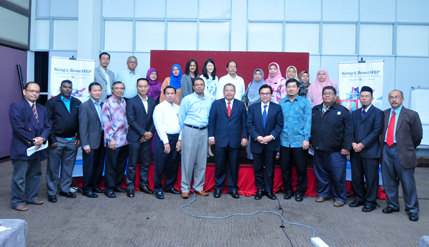 BANGI, 21 May 2014 – The private sector and academics from The National University of Malaysia (UKM) have agreed that sharing information and exchanging notes may help efforts to prepare Malaysia face the expected challenges in a globalised economy. An official panel consisting of six economic academics from UKM and six representatives from the private sector acknowledged that they can work together on a regular basis to ascertain whether research theories overlap with real-life business practices. They had their inaugural meeting at the UKM campus here last week organised by the Faculty of Economics and Management (FEP). It was moderated by Vice-Chancellor Prof Datuk Dr Noor Azlan Ghazali, who expressed satisfaction with the outcome saying it would be an annual event. The panel named Kongsi Ilmu@FEP discussed the extent their respective fields had in common. Prof Dr Mansor Jusoh, an expert on Islamic banking such as Al-Murabahah, proposed Islamic debt-based instrument using the principle of exchange or deferred contract of exchange. A member of the private sector group, former Proton Chairman and now Chairman of Nadicorp Holdings, a new electric car venture, Datuk Seri Mohd Nadzmi Salleh acknowledged that Islamic debt-based financing serves as an automatic stabiliser on credit and money supplies. Demand for Murabahah goes down when the inflation rate rises. Haji Shahrizin Hj Abdul Sarhadat, deputy director of MARA (Policies and Strategic Planning) concurred that Murabahah could help limit the taking of credit. Another academic Associate Prof Dr Tamat Sarmidi tabled his findings that when compared to the developed economies, Malaysia is ranked negative in financial liberalisation. Dr Tamat said this meant that the country is not doing enough to encourage open competition and attracting foreign investments, which Malaysia is overly dependent on. Commenting on that Nadzmi said the country still needed affirmative action to “buffer” local businesses and help them build up capacities though he agreed that Malaysia needed to liberalise its financial sector, albeit in stages. However, Dr Tamat remarked that implementing change step-by-step is not enough. “Someone told me that if you go to the dentist, don’t pull out the teeth gradually over several visits. Do it all at once. It may be very painful but only once. It is better than going (to the dentist) several times and feeling the pain many times,” he said. Associate Prof Dr Noor Aini Khalifah, however, felt that the Malaysian economy was becoming too liberal to enable local companies to compete on an equal footing with the foreign companies. The domestic companies – from the small traders to conglomerates – are slowly but surely being replaced by their international counterparts, Dr Noor Aini said. Datuk Seri Nadzmi said there are definite benefits of having foreign companies here though he cautioned that Malaysia should have a strategy to prepare for the time when large corporations may suddenly pull out. Another academic researcher, Dr Rozita Amiruddin spoke of the need to place strong management in firms. In her paper, she said every company needs a tailor-made Management Control Systems (MCS) based on research and development requirements. The MCS should influence employees’ behaviour towards increasing the probability of achieving an organisation’s innovation goals. The private sector panellists gave a lukewarm reception to the proposal with Nadzmi saying that it was not necessarily true that strong control meant better success or that less control meant failure. As for companies facing liquidation, Assistant Prof Dr Razali Haron proposed a formula to predict the optimum amount of debt a firm may have that could minimise bankruptcy risk. Nadzmi, however said in Malaysia there are many businesses that are being kept running for socio-political reasons despite losing millions of ringgit every month. “I run a bus company that makes no sense; no fare hikes allowed,” he lamented, referring to the transport firm Konsortium Transnasional Berhad, where he is Chairman and Managing Director since 1996. He said service to the people is vital and the bottom line is not the only consideration to the government.